The Lutheran sacraments are "sacred acts of divine institution". Lutherans believe that, whenever they are properly administered by the use of the physical component commanded by God along with the divine words of institution, God is, in a way specific to each sacrament, present with the Word and physical component. They teach that God earnestly offers to all who receive the sacrament forgiveness of sins and eternal salvation. They teach that He also works in the recipients to get them to accept these blessings and to increase the assurance of their possession. If we define the sacraments as rites, which have the command of God and to which the promise of grace has been added, it is easy to determine what the sacraments are, properly speaking. For humanly instituted rites are not sacraments, properly speaking, because human beings do not have the authority to promise grace. Therefore signs instituted without the command of God are not sure signs of grace, even though they perhaps serve to teach or admonish the common folk. The Sacrament of Holy Baptism is the sacrament by which one is initiated into the Christian faith. Lutherans teach that at Baptism, they receive God's promise of salvation. At the same time, they receive the faith they need to be open to God's grace. Lutherans baptize by sprinkling or pouring water on the head of the person (or infant) as the Trinitarian formula is spoken. Lutherans teach baptism to be necessary, but not absolutely necessary, for salvation. What that means is that although baptism is indeed necessary for salvation, it is, as Luther said, contempt for the sacraments that condemns, not lack of the sacraments. Therefore, one is not denied salvation merely because one may have never had the opportunity to be baptized. This is what is meant by saying that baptism is necessary—but not absolutely necessary—to salvation. The rite of Penance (confession) is not universally observed as a sacrament in the Lutheran Church, primarily due to the consideration of lack of a visible element. The Sacrament has two forms: the General Confession (known as the Penitential Rite) that is done at the beginning of the Eucharistic service. In this case, the entire congregation says the Confiteor, as the pastor says the Declaration of Grace (or absolution), and Holy Absolution that is done privately to a pastor, where, following the person (known as the penitent) confessing sins that trouble them and making an Act of Contrition, the pastor announces God's forgiveness to the person, as the sign of the cross is made. In historic Lutheran practice, Holy Absolution is expected before first partaking of the Eucharist. General confession, as well as Holy Absolution, are still contained in the Lutheran hymnals. Two works which are part of the Book of Concord, the Confessions of the Lutheran Church, lend support to the belief that Holy Absolution is for Lutherans a sacrament. The Apology of the Augsburg Confession acknowledges outright that Holy Absolution is a sacrament, referring to it as the sacrament of penitence. In the Large Catechism, Luther calls Holy Absolution the third sacrament, referring to it as Penance. Confirmation is a public profession of faith prepared for by long and careful instruction. In English, it is known as the "affirmation of baptism", and is a mature and public profession of the faith which "marks the completion of the congregation's program of confirmation ministry". The German language uses for Lutheran confirmation a different word (Konfirmation) from the word used for the same Sacrament in the Catholic Church (Firmung). Confirmation teaches Baptized Christians about Martin Luther's doctrine on the Ten Commandments, the Apostles' Creed, the Lord's Prayer, the Sacrament of Holy Baptism, Holy Absolution, and the Sacrament of the Eucharist. An average catechism class lasts about two years. Holy matrimony is a union between two lovers, acknowledging the grace of God in their life. Lutherans, on the whole, reject the Roman Catholic teaching of Holy Orders because they do not think sacerdotalism is supported by the Bible. Martin Luther taught that each individual was expected to fulfill his God-appointed task in everyday life. The modern usage of the term vocation as a life-task was first employed by Martin Luther. 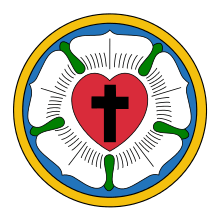 In Luther's Small Catechism, the holy orders include, but are not limited to the following: bishops, pastors, preachers, governmental offices, citizens, husbands, wives, children, employees, employers, young people, and widows. However, in some Lutheran churches, Holy Orders refers to the three orders of bishop, priest and deacon, and the sacrament or rite by which candidates are ordained to those orders, is retained. The Lutheran Church, like others, use James 5:14–15 as biblical reference for Anointing of the Sick. The process of this rite consists of laying on of hands and/or anointing with oil; while the form consists of prayers. 1 2 3 4 Graebner, Augustus Lawrence (1910). Outlines Of Doctrinal Theology. Saint Louis, MO: Concordia Publishing House. p. 161. ↑ Article XIII: The Number and Use of the Sacraments, vv 3–4, Apology of Augsburg Confession, The Book of Concord, Minneapolis, MN: Augsburg Fortress, 2000, 219 – 220. ↑ F.L. Cross, ed., The Oxford Dictionary of the Christian Church, second edition, (Oxford: Oxford University Press, 1974), 340 sub loco. ↑ Apology of the Augsburg Confession, article 24, paragraph 1. Retrieved 2010-04-18. ↑ Tappert,TG ed. "The Book of Concord". Fortess Press, 1959, pp. 221 & 445. ↑ Max Weber, The Protestant Ethic and the Spirit of Capitalism, trans. Talcott Parsons, Ch.3, p. 79 & note 1. ↑ "FAQ". Anglo Lutheran Catholic Church. Retrieved 28 December 2012.